FNH Audio presents a slightly abridged performance of this third volume of Charles Oman's military history classic. In this third volume, a detailed examination is made of the period from September 1809 to December 1810. This volume covers the battles of Ocana, Cadiz and Bussaco. It also examines in detail Massena's march through Portugal to the lines of Terres Vedras, the lines themselves, and his final retreat away in a desperate search for food. This history, written many years after Napier's, draws its information from more firsthand accounts and corrects some of more glaring mistakes and biases of Napier. Although this audiobook is abridged, the only text removed is that in French or Spanish, namely Appendix 5 and Appendix 11. A small number of footnotes scattered throughout the book in those languages have also been omitted. All English text from the appendices and footnotes is present. 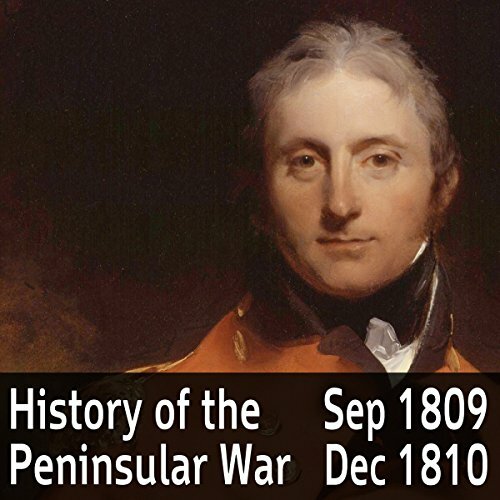 Volume 1 of this set is available under the title A History of the Peninsular War 1807-1809. Volume 2 of this set is available under the title A History of the Peninsular War Volume 2: January - September 1809. I love military history, and have revisited Oman perhaps as often as Thucydides. But when reading a text demands that one pronounce French, Spanish, or Portuguese (not to mention English) with some degree of accuracy, or at least without impeding comprehension, why oh why are such comically inept readers chosen for such an obviously demanding task? Readers with such skills can be found, as for instance for Cornwell's Sharpe novels. Not a single language, even English, manages to escape mangling by Mr. Herriot however, and it is to be hoped that the publisher might redo these recordings, with someone able to pronounce at least one or two of the requisite languages passably well. That said, Mr. Herriot brings a some enthusiasm to the task, which makes this long narrative lively when it might have been ponderous. Some good maps will allow the reader to follow events despite Mr. Herriot's otherwise incomprehensible renderings.